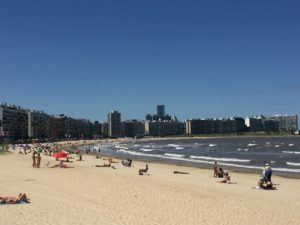 I spent January 2018 remote working in Montevideo, Uruguay. I’ve been excited about this experience for months, and for good reason – it’s been incredible spending a month I normally have to trudge through (I’m not a Winter person) enjoying summer sunshine, palm trees and ocean breezes, as well as light-filled skies until 9:00pm. However, remote working is not always a perfect experience. I learned a few things on this trip that will help me enjoy the next time even more, and will hopefully improve your future remote work experiences as well. When you think about leaving freezing temperatures for a summer beach town, you assume that, emotionally and physically, life will be all sunshine and ocean breezes. But I can attest that a dramatic change in environment combined with the knowledge that you won’t see your loved ones for a while can initially leave you feeling a little dazed and out-of-sorts. The good news is that it fades quickly as you get to know and enjoy your new environment. Keeping busy is helpful, but you may need to sit with the feeling and acknowledge it for a while before it passes. Also, remember to bring a few mementos from home to help you get on your feet – I brought my birthday and Christmas cards with me. 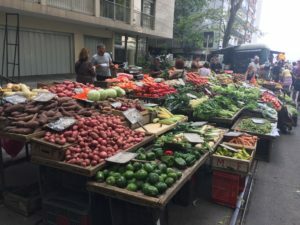 My neighborhood had a Farmer’s Market every Friday. Another thing that helped me feel better in my new surroundings was the barrio I stayed in. I deliberately chose a highly residential area with tree-lined streets, lot of shops and a strong neighborhood vibe. That made it easy for me to go on walks, see neighbours all around me, and generally feel at home. Technology like Google maps allows you to check out the areas you’re considering staying, so take a look before you book to ensure you’ll be happy in that situation. When you go on vacation, you feel an (inward) sense of moral outrage if anything goes even a little wrong. How dare it be raining? How dare something happen at work? Nothing is supposed to go wrong when I’m on vacation! I brought this feeling along on my trip without stopping to think that a month is a long time for absolutely everything in life to go smoothly. So, it was a rude awakening when mundane issues (I got a cold! My AirBnB had maintenance issues!) found me in Uruguay. But after a few minutes of sulking, I realized the best approach was to get the issues addressed as quickly and efficiently as possible so I could get on with the business of enjoying this incredible experience. Before leaving for Uruguay, I thought I’d found the perfect app to record my executive interviews with research participants, so it was a blow when it didn’t work once I got there. Fortunately, I found another app, but when I do this again next year, I will be bringing a digital tape recorder with me so that if all other technologies fail me, I can at least put the phone on speaker and record from there. With technology, hoping for the best and planning for the worst is always the best strategy. You don’t want to make your work more stressful, less productive or less effective because of a preventable technology issue. This may sound like facetious advice, but I forgot mine (who packs an umbrella? ), and spent a memorable afternoon soaked to the skin as I checked out Montevideo’s art museums. Of course, it’s not just an umbrella you might forget. When you’re traveling for a longer amount of time, you need to consider the everyday living items that you don’t necessarily bother with on shorter holidays. One of those items for me was Oil of Oregano – which drastically reduced the timeframe of the aforementioned cold. My favourite after-work chill spot. It’s a cliché for a reason – shaking things up will wake you up, bring you joy (and yes, stress and anxiety) and greatly enrich your life. I’m so glad that I had this experience, and I hope that some of you will consider doing the same. I can guarantee that you won’t regret it. Great advice Ellen. Sounds like you had s life changing experience.